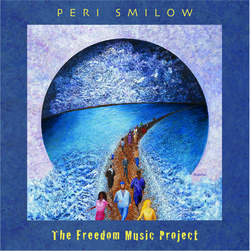 Peri Smilow and THE FREEDOM MUSIC PROJECT brings together an electrifying choir of young Jewish and African-American singers, celebrating the freedom music of both the Passover tradition and the Civil Rights Movement. Featured vocalist and project creator Peri Smilow brings two communities together around the shared value of freedom, and their shared experience of generations of slavery. The music on this CD represents the first steps on the path toward mutual understanding and friendship. This unique recording, produced and arranged by LeRoix Hampton, Josh Nelson, and Peri, captures that spirited feeling so appropriate for the music of Passover and the Civil Rights Movement. Peri's profound, original compositions, “Where Was God,” “One Small Step,” and ”Ha Lachma Anya” fit thematically with freedom ballads, “Wade In The Water,” “Follow The Drinking Gourd,” “Make Those Waters Part” (Mishkin), “Keep Your Eyes On The Prize,” and “Oh Freedom.” And, you have never heard ”Avadim Hayinu,” “B'chol Dor Vador” or ”Chad Gadya” quite like this! THE FREEDOM MUSIC PROJECT is a monumental labor of love that will make a difference in your musical life.